The IMF just released its second review of Greece’s program (here). In the document, the Fund has updated its projections for the trajectory of Greek debt in light of the most recent revisions in deficit and debt statistics conducted by Eurostat in November 2010. 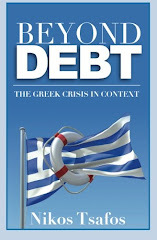 In the May 2010 forecast, the Fund expected Greek debt to start from 133% of GDP in 2010, peak at 149% of GDP in 2012-2013 and then decline to 120% of GDP in 2020. In September 2010, the Fund revised its forecast due to higher inflation and a slower correction in the current account. In September, the IMF forecasted Greek debt to reach 144% of GDP in 2012-2013 before starting to decline to an eventual 111% of GDP in 2010 (see here). In December 2010, the Fund has increased its 2010 number given the inclusion of new liabilities in the official statistics. The debt-over-GDP ratio starts off at 141% of GDP in 2010 and peaks at 158% of GDP by 2012-2013. By 2020, the IMF expects Greek debt to reach 131% of GDP. So while in its September forecast the IMF saw 2020 debt lower than 2009 levels (111% vs. 115%), it has now reverted back to its original (May) expectation that Greek debt will not reach its 2009 levels until after 2020. Of course, these are baseline scenarios and looking at the range of forecasts is quite instructive. The IMF runs six scenarios which offer dramatically different outcomes: in the best case (within the scenario parameters), Greece’s debt reaches 91% of GDP in 2020; in the worst, it reaches 192% of GDP in 2012. The most important variable is economic growth. The baseline projection shows Greek GDP growing at 2.3% a year from 2012 (after the recession ends) to 2020. If GDP grew by one percentage point higher than the baseline, Greece’s debt would fall below 2009 levels by 2016; by 2020, its debt would be a manageable 91% and falling by 9-10 percentage points a year. By contrast, if the economy grew at one percentage point less than the baseline, debt would never fall in the forecast period and would peak at 178% of GDP in 2020. Besides growth, the other variables are contingent liabilities, interest rates, deflation and a lower primary deficit. Of these, interest rate on new debt and a lower primary deficit make the least different versus the baseline. Contingent liabilities are by far the most crucial: this scenario includes “identified guarantees to public enterprises that remain outside of the general government (for a total of €8 billion), and the state-guaranteed liquidity support of the ECB to the financial system of €55 billion. All privatization proceeds are assumed to be zero under this scenario.” In this scenario, default will be even harder to avoid. First, they highlight that bank health is central to limiting contingent liabilities – if the state has to bear these liabilities, life will get very tough. Second, they also show that the obsession over spreads – the borrowing cost for Greek debt - is in a way overblown relative to other things that can happen. The average cost for debt is estimated at 5.5% for the forecast period (2010-2020) with new debt costing 6.3%. A scenario where borrowing takes place at 200 bps higher (8.3% vs. 6.3%) makes an impact of 14 percentage points of debt-over-GDP by 2020. Finally, they remind us that it all comes down to growth. Whether Greece can pay down its debt boils down to whether it can generate growth. Nothing else matters.